An Oreo lover’s dream! Delicious layers of Oreo flavoured cake and buttercream with chopped up Oreos for some crunch. Hello Oreo lovers! Do I have your attention? Good, because I’m pretty sure this cake is for you. As you know, Ryan tends to be my go-to guy for ideas when I’m stuck on something to bake. Naturally, he gravitates to things that he already loves and asks me to turn them into cakes. Hence the Cinnamon Toast Crunch Cake, the S’mores Cake, and the Turtles Cake. His most recent request was this Oreo Cake! My arm didn’t need much twisting, since I am also a big fan of Oreos, though truthfully I prefer Golden Oreos to the original. Something about that vanilla cookie flavour goes SO well with the Oreo filling. So look for those to be used in a dessert in the future. 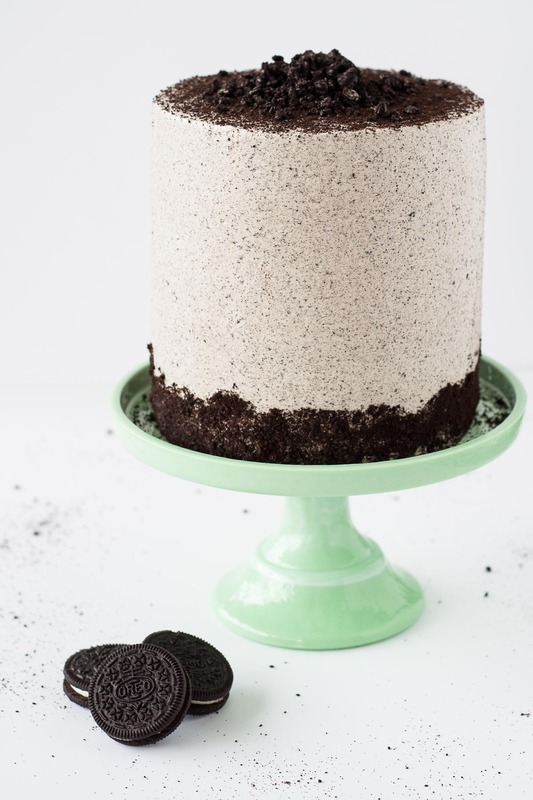 This cake is packed with Oreo flavour. There are Oreo cookie crumbs in the cake layers and frosting, as well as chopped up Oreos sprinkled between each layer for some crunch. 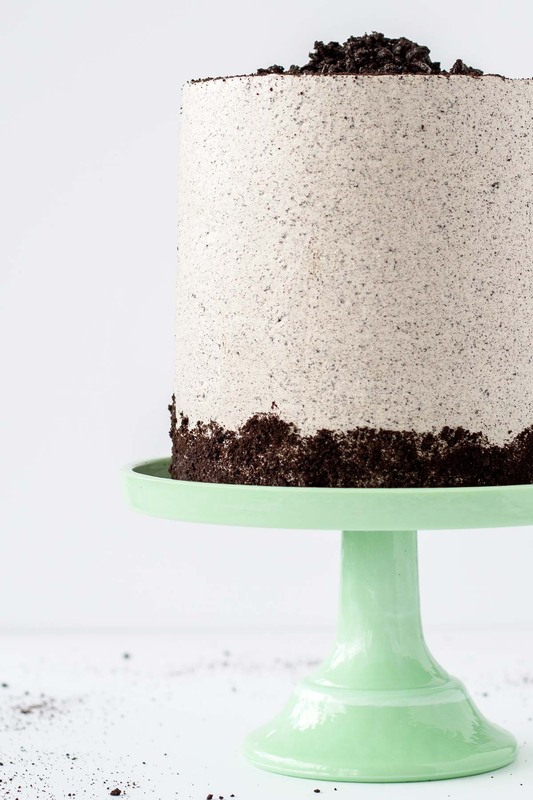 The cake has a rich not-too-sweet chocolate flavour and pairs well with the sweet Oreo buttercream. You’ll be eating that buttercream with a spoon, I guarantee it! Six layers of pure heaven right here. This cake did not last long! This cake did not disappoint. 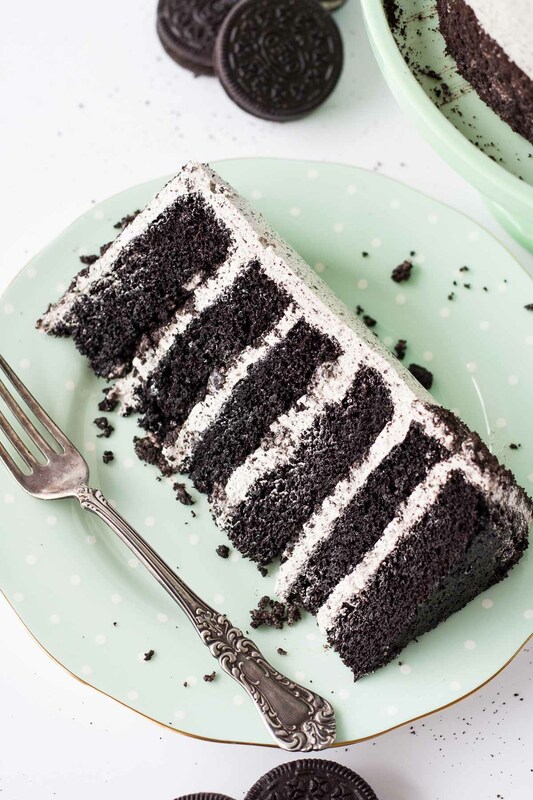 If you have an Oreo lover in your life, or if you are one yourself, this Oreo cake is one you’ll want to add to your list! 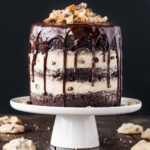 Your favourite cookie transformed into a delicious layer cake! To enhance the chocolate flavour of the cake, use strong hot coffee instead of hot water. The cake layers are easiest to frost when they are chilled as they are a bit firmer and help the buttercream set quicker. You can do this as a 3 layer cake instead, but you will have some buttercream left over. An Oreo lover's dream! 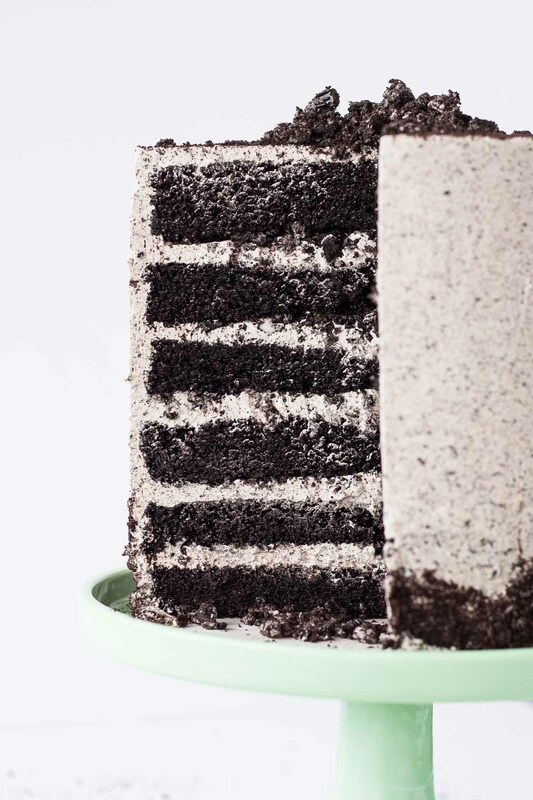 Layers of Oreo cake, buttercream, and chopped up Oreos for some crunch. Cool 10minutes in the pans then turn out onto a wire rack to cool completely. Once cooled, cut each layer in half horizontally to get 6 layers. Switch to paddle attachment. Slowly add cubed butter and mix until smooth. Place one layer of cake on a cake stand or serving dish. Top with about 2/3 cup buttercream and sprinkle with chopped Oreos. Repeat with remaining layers. Frost and smooth the outside. Add additional Oreo cookie crumbs along the bottom and top if desired. I’m planning on making this cake using an 8″ pan, but I was going for a 2 layer cake as I don’t want it too big. How should I adjust the measurements for everything? And should I make one cake and cut it or can I make 2 smaller cakes to just put on top of each other? Hi Gemma! The recipe as is will work for a 2 layer 8″ cake — the layers will be slightly thinner though. Hi Liv! I’m a big…huge fan of your recipes. I’ve made quite a few with much success. I was wondering if I can cover this more cake with fondant? Will the bits of crumbs in the buttercream interfere with my fondant being as smooth as possible? Thank you. Hi Marizza! I think it should be fine provided your crumbs are fine and the fondant isn’t too thin. Dearest Liv … I will be baking 2 batches of this for my Nephews birthday. To feed the hungry 14 year old cricket team I am going to build a 4 layer cake. Do you think I should place a board in the middle on top of the first 2 layers? My thoughts were for stability and to help for cutting and serving. So many boys to feed!! Appreciate your reply. Much love and thanks. Hi Kristy-Ann! Hmm, you know I think I would, just to be safe. The cakes are fairly heavy and it will definitely help for cutting/serving! Hi Rebecca! There was a slight issue with my site this morning that caused that to disappear. It should be back now! Hi Amanda! Converting pan sizes is always tricky. Here’s a site I use as a guideline: http://www.joyofbaking.com/PanSizes.html I think the layers would be a bit thinner in the 9″ pans. If I double this recipe, do you think I could I make an 8” version with the six layers? Or will the 8” layers still be too thin to cut in half? Also, I’m surprised by the lack of butter in this cake recipe! Do you think I could sub melted brown butter for the oil? I have found that rown butter gives a delightful richness to chocolate. Hi Shana! The recipe as written will make two 8″ layers, though they will be thinner than the ones you see here and maybe harder to cut in half. You can try swapping in cooled, melted brown butter, but it will affect the texture of the baked cake (might not be as moist). I hope that helps! I ended up doubling the recipe for three 8” layers. I used a scale to split the batter evenly between pans, they took 45-50 min to bake and came out comepletely flat for the most part. They ended up being about 1.25” tall, so I think I’m just going to make the cake three layers rather than six (they are currently in the freezer). Update: I made the cake 3 layers, and I froze the layers for 5 days. 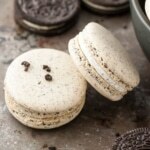 I used the Oreo SMBC from this recipe as well. If anyone wants to make the 3-layer 8”, you could probably get away with 1.5 times the buttercream recipe. I didn’t want to have too much, so I originally only made the recipe as listed above, but after I filled and crumb coated the cake, I didn’t have enough left for an outer coating. I actually ended up mixing what I had left with American buttercream and more Oreo crumbs, mostly out of laziness (it was still delicious). I added to this recipe by drizzling fudge sauce on top of the crushed Oreos in between the layers. It was delicious. Rave reviews from everyone at the party. The cake was moist, fluffy and not too sweet. Highly recommend! Is there an egg white substitute I can use for the butter cream? Hi Bre! Not that I’m aware of, not for this kind of buttercream anyhow. Hi! I’m planning to make this cake this weekend. 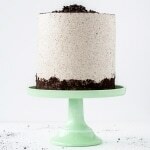 I want to use my mom’s chocolate cake recipe and make amendments to make it more Oreo-y. For example, I’ll sub 1/2 the cocoa for black cocoa. I’d like to add the 1/2 C Oreo crumbs… but I’m not sure if I should reduce the flour or sugar by same amount? I’m guessing sugar… I love your blog. I make a “Fancy Cake” about once per month and have my friends over for a big reveal. Everybody’s trying to get on the “Face Cake” invitation list! Thank for you for the great inspiration!! Hey just wondering what is the depth of the cake tins that you use. Hi Rae! Mine are all 2″ deep but 3″ would work just fine. Hi Amanda! The recipe as is will work for a two layer 8″ cake, so I would 1.5x the recipe. Yay! So glad to hear it worked out 🙂 I’ll check my IG! Thank you! Most of my recipes can be made in two 8″ pans instead of three 6″. The layers will be a bit thinner in the 8″ though, so baking time would be a bit shorter, but otherwise should be fine! If you want to have thicker 8″ layers, for this one in particular, adjust the Servings slider to 16 instead of 12 and that should scale all the ingredients up. Let me know how it turns out! Thank you for the recipe. My cakes seemed to “cave” in the middle – do you know why that would happen? I used 6″ Fat Dadio pans but did not have them wrapped like you suggested. My oven is electric and the temperature does fluctuate but it’s been a pretty steady 340-350 while baking. Any feedback would be appreciated. I’m making this for my niece’s birthday and really want it to come out perfect. If you’re not, then I suspect the cake just needed more time in the oven. Did it sink once you took it out or while it was still baking? Hi Olivia – thanks for your speedy response! I live in NYC and the cakes were sinking while baking. I left them in longer because the middle was undercooked but the sides were definitely baked. I finally took them out and because they were so indented, I decided to scrap them and taste it and it seemed like the sides tasted burnt. It’s so hard to see because the cake is so dark. I will try it again and maybe do it at a lower temp? For what it’s worth – the parts that weren’t burnt tasted AMAZING!! Oh – and i totally nailed the frosting – it is divine!!!! The sinking while baking is usually caused due to too much raising agent. Did you use self-raising flour by chance? And were the amts of baking soda and baking powder correct? That’s the only thing I can think of that would cause it to sink while in the oven. OH unless, did you open the oven door or move them around before they were set? That will cause it too. This cake was so absolutely delicious. Made it for my nephews birthday and everyone LOVED it. Thank you for posting!! Hi, I loved the few recipes I have made from your blog…Would you mind if I mention you on my instagram page whenever I use your recipes? Hi Gabriela! Thank you! I don’t mind at all, I would love to see what you’ve made! I made this cake for my son’s birthday party this weekend and OH MY GOSH it was SO DELICIOUS! So glad you liked it Meagan!! Hi! I just found your site and absolutely LOVE it! This cake was great! The cake was moist and not overly sweet, and the swiss meringue buttercream was great too! The only question I have about this recipe is that when switching the ingredient quantities from US to Metric the number of egg whites changes for the frosting. I used the 6 egg whites and it came out fine. For anyone wondering, I this cake in two 8″ pans and each rose to be about an inch in height. Also, I found that adding “chopped” oreos worked out better for me for both the cake and the frosting. PS – next week I’m going to try the dulce de leche cake for Super Bowl Sunday. Liv – today I made this cake (my second of your recipes, the first was the mocha cake) and it was delicious! Tasted just like an Oreo cookie. I will say, I agree with a previous poster about the buttercream being far too buttery. I read your comment back, but my egg whites had a beautiful peak before adding the butter. We all enjoyed the mocha cake buttercream and that had one less stick butter. I’m not sure if it’s the ratio or something else I did but overall it was really good! I’m new to cake baking but I love your easy to follow blog posts. Not sure if it’s beginners luck or your great details but I’m two for two. Thanks! WOW! This cake was DELISH! I just made it for my son’s birthday…everyone loved it! I didn’t have black cocoa powder, but it was amazing using regular cocoa. I can’t wait to try it again with black cocoa! Not sure how much better it can get, but definitely going to give it a go! Hi Melissa! Yay! So happy to hear that everyone liked it 🙂 Black cocoa will make it taste even more Oreo! If I don’t have black cocoa can i put in additional oreo crumbs? Hi KK! I would use regular cocoa in place of black cocoa then as not to change the texture too much. For the Buttercream, when you say to place the mixing bowl over a hot water bath, do I do this while the water boils? Or just boil some water and place the mixing bowl on top? 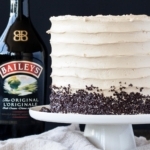 I’ve never tried to make this type of frosting so any help would be much appreciated! 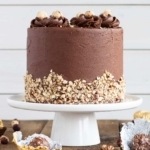 would love to make this cake for my sons birthday, but he does not like chocolate cake (i know, weird) do you have any ideas on how to make a white cake with the cookie crumbs still in the cake? Hi Rebecca! Do you mean a white Oreo cake? Like a golden oreo one? Or something different? If so, what kind of cookie crumbs were you wanting to use? I was thinking of just making a plain white cake, and adding the oreo cookies, but i was not sure if i make your white cake and then just add the cookies to the batter, do i need to adjutst the recipe in any way, or the bake time? Now i am thinking of maybe making your peanut butter cake and using this oreo frosting on it, my son loves peanut butter, and oreos, so why not, i don’t know how it will taste, its worth a try, still debating on which cake to make. Hi Cetta, sorry to hear this one didn’t work out for you. The edges should not be hard — perhaps it was overbaked? As for the buttercream, it will have more of a buttery flavour vs typical American buttercreams but it should not taste like you’re eating a stick of butter. It sounds like maybe the meringue didn’t whip up properly before you added the butter. Thanks again for your sharing. Hey liv! So excited to try this one for my husband and brothers birthdays this weekend. Quick question, where do I find black cocoa powder? I’m in Ontario so hoping you found it in a Canadian store as I don’t have time to order through amazon. Would bulk barn have it? Where did you get it? Hi Lauren! Doh, I get it at a local gourmet food shop here (https://gourmetwarehouse.ca/black-cocoa-powder-250g/), are there any specialty shops like that where you are? Where are you located, maybe I can ask some food blogger friends in ON. I hope you can find some as it really adds to the flavour and makes it taste more like an Oreo! Regular cocoa would work as a back-up, but it would change the flavour. Is there a way to make this into cupcakes? I need something that’s able to travel well! HI Caity! This recipe should work fine as cupcakes. Just be sure to adjust the baking time as needed. Is the sugar in the buttercream meant to be grandulated or powdered? I made a frosting from another blog one time with grandulated and it was gritty. Hi Emily! So sorry for the delay, I’ve been travelling. This is a meringue based buttercream so it needs to be granulated. You dissolve it completely though while you’re warming up the whites. Cake came out great! I did 3 layers with an 8″ cake pan. I did have to make more batter, but that was fine. The buttercream was delicious! The only bummer was I put it in the trunk of my car and my parents live about 90 mins away and we were having a mini heat wave so when I took the cake out of the car and brought it in the house, I saw that the buttercream on top had melted (I had put Oreos around the top and they fell off). I was bummed, but I had taken “before” pictures – thankfully. And the family loved it regardless. So… yay for first time cake-baking success! 🙂 Thanks for an awesome recipe! Yay! So glad it turned out 🙂 So sorry to hear about your mishap while travelling!! I would be so stressed out travelling with a cake, nevermind in a heat wave. Glad it still worked out though and that everyone loved it 🙂 Congrats on your first time cake-baking success!! Hi Olivia! Though I love to bake, I’ve never made a cake before in my life! I decided to try to make a cake for Father’s Day this year and perused Pinterest and found your amazing Oreo cake. So I’m going to attempt it. eeek! 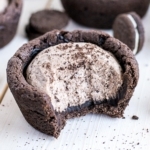 Questions – do you use the cream of the Oreo for anything? Does the cake taste like a big Oreo?? 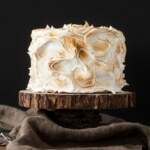 And, would it be possible to pipe some of the buttercream along the edges or on the top? I’m borrowing some cake pans from a friend and I believe they’re 8″ Is it ok to use 3 of those? Will I need to alter the batter at all? – I buy just the Oreo cookie crumbs themselves, like graham cracker crumbs, but they’re not available everywhere (I’m in Canada). So, I don’t use the filling, but you could try adding some of it to the buttercream if you want? It would make the buttercream sweeter though. 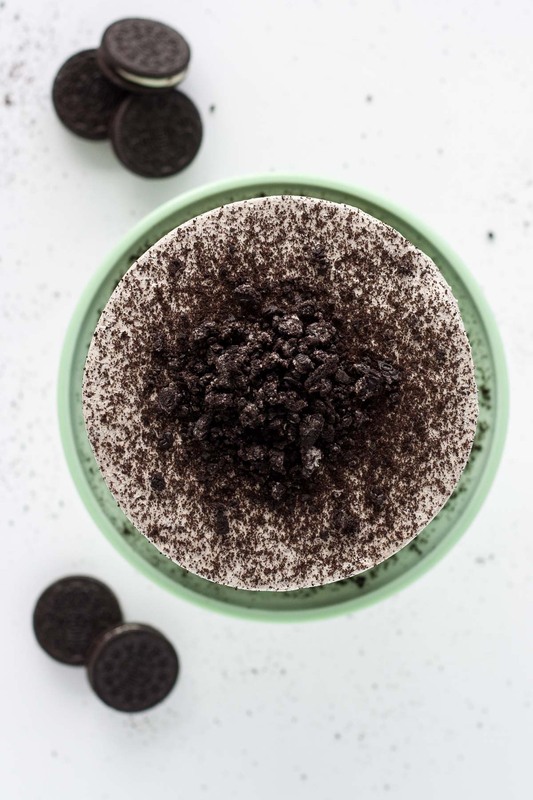 – The thing that makes this cake taste most like an Oreo, besides the cookie crumbs, is the black cocoa, so use that if you can!! – I can’t totally remember, but I don’t think I had enough frosting left over to pipe along the top. If you do this as a 3 layer cake instead of 6 layers though then you’ll be fine. – If you use three 8″ pans, you need to double the recipe. Or use the recipe as is in two 8″ pans. I hope that helps! Let me know if you have any more questions 🙂 And good luck! Thanks so much for the quick reply! So if I use 2 8″ pans, I can then slice the layers to have 4 layers instead of 2. Will I have enough of the buttercream for all that? And do you think I’d have enough to pipe a bit on the top and/or bottom? That *should* give you enough as long as you don’t go too heavy in the layers. And yes, your plan is a good one! Just cover the cake layers with plastic wrap Friday night. The frosted cake should be refrigerated. Just bring it to room temp (2-3hours) before serving. Is this cake ok to leave out? Or do leftovers need to be refrigerated? Can you freeze the cake and frosting separately ? You can! I do that often. You will likely need to rewhip the frosting once it comes back to room temperature though. Hi, could I freeze the cake and/or frosting before a party? Thank you it looks great! Hi Aviv! Yes, both freeze really well. If you freeze the frosting separately, you may need to rewhip it when it thaws. I tried the icing, however the meringue never stiffened (even though there was no grease on my tools). Normally with meringues I need to start to whip the egg whites, then add the sugar- so this was a first attempt at doing them at the same time. Unfortunately, I am out of eggs, so I can’t try to remake the recipe. Hi Sarah! Sorry to hear about your meringue troubles. If it never stiffened the culprit had to be either grease or trace of egg yolk in the whites. I always wipe down all my equipment with lemon juice to make sure everything is grease free. Also, did you happen to use egg whites from a carton? I had problems with those whipping up before. Hiya, I don’t have black cocoa powder. Can I just replace it with more Dutch processed cocoa? 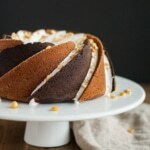 I want to make a very special cake for my husband’s birthday and I’m so happy I found this recipe!! (Didn’t notice it in instagram before?!) I’ m struggling a bit with the measures, can you please tell me how much gramm is one cup? When I google I see different results and I want this cake to be perfect!! But you have to be sure to select the correct ingredient from the list on the right. 1 cup of flour is 125g, 1 cup butter is 227g, 1 cup sugar is 200g. I hope this helps! made this cake last weekends- was AMAZING! Question though- for the Oreo Cookie crumbs- should the creme filling be scraped out first? The frosting, while delicious, was a bit too sweet for our taste and I was thinking by removing the creme from the cookies we’d remove some of the sweetness. Not sure how that’d affect the overall taste though. Anyway making another one this weekend since it was such a hit. thanks so much for such an elegant, beautiful oreo cake! Just having a go at this now! Well, admittedly second attempt after I stupidly didn’t line my pans with an earlier version. Not that anyone in this house minds, the cake pieces taste amazing with ice cream 😄 First time cooking one of your recipes and I’ll definitely be looking round for more inspiration. Thanks for sharing. Ohh exciting! You have to let me know how it turns out/how you like it. Glad to hear the cake scraps didn’t go to waste ;). I’m trying to get the recipe for the six layer Oreo cake. It shows the ingredients but not the directions for making it. Hi Linda! The directions should be listed right below the ingredients. Are they not showing up for you?? Great, thank you so much! Any advice if I opt to try the three 9″? I need a pretty large cake. Hi Hana! You can use the recipe as-is in 9″ pans too, but the layers will be a bit thinner. Though that doesn’t technically make for a bigger cake ;). You can try doubling it and then adding in another half recipe. Or tripling the recipe? Just make sure the batter doesn’t go more than 1/2 way up the pan or so, max 2/3rds as it rises a lot! Oops, I meant that the doubled recipe would work well in three 9″ pans, but that they’d be thinner. Hi liv. Mine is in the oven. Fingers crossed. I only have an 8″ pan. So ill half it later. Its for tomorrow church potluck. Im using strawberry oreo. Ah cant wait. Hi Elizabeth! Did you make it all in one 8″ pan or two? Let me know how it turns out!! Hi Hana! If you double the recipe it will work perfectly in three 8″ pans or you can use the recipe as is and make two 8″ layers. I hope that helps! Do you think it would be safe for the cake, if I skip Oreo crumbs in the batter? Omgggg this cake looks AMAZING!!!! 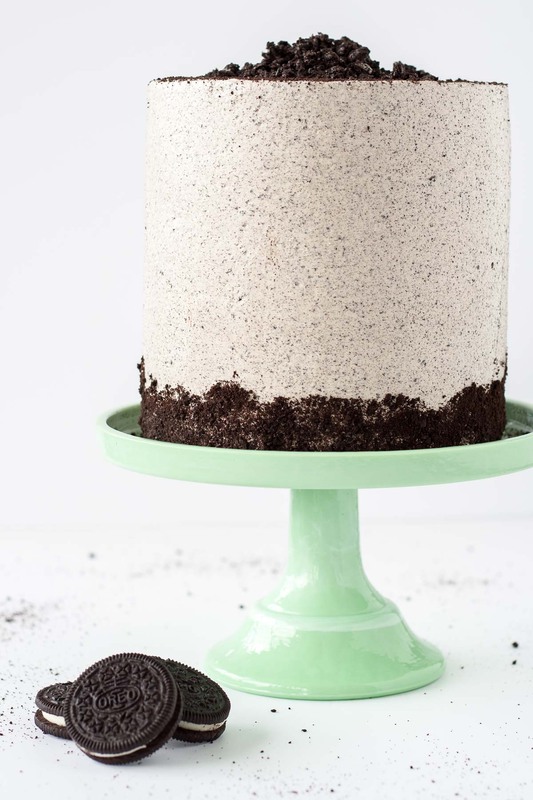 Oreos are probably my favorite kind of cookie but to make it into such a beautiful looking cake -GENIUS! Where did you get the mint green cake stand?? Hi Leigh! I actually got it at a discount store here called Homesense. You can find similar ones on Amazon or World Market. Look for Jade Green Cake Stand :). This looks awesome! Did you split each of the 3 cakes to get 6 layers, or did you just double the recipe? Also any tips for pressing the crumbs onto the bottom edge of the cake? Ack! Yes, I did, but apparently I missed mentioning that in the recipe! Thanks for letting me know! I will update it. 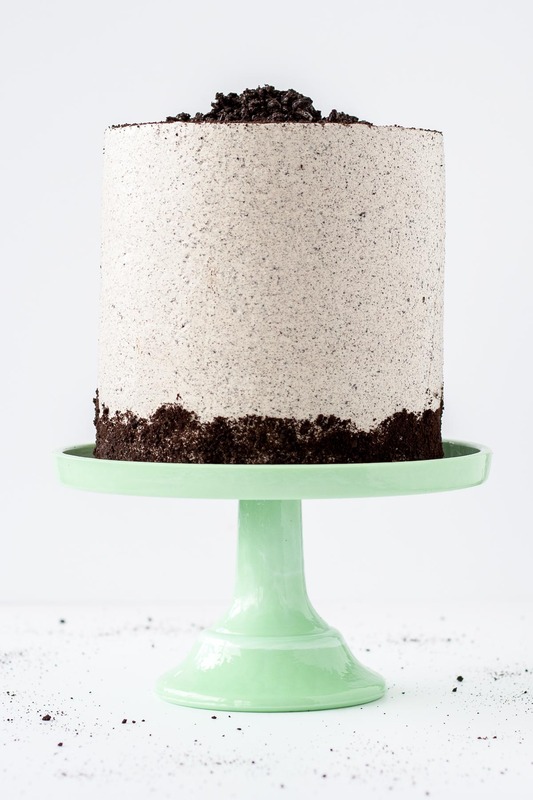 As for pressing crumbs into the bottom, I had the cake on a cake board and placed it on an inverted bowl so the edges hung over a bit and then carefully pressed it into the sides. Does that make sense? If not, let me know and I’ll try to find a picture of it :). I adore golden Oreos! Everyone thinks I’m crazy when I say I prefer them. They remind me of duplex cookies which I loved as a kid. Golden Oreos are the BEST, glad you’re on my team :D.
Omg my boys (and I) will love this cake! I’m going to try this one immediately! My husband is an oreo fanatic! he will love this! Thanks Kristen! I hope you try this :D.